English football club Arsenal’s US owner Stan Kroenke. Photo: AFP. Last week, when Russian businessman Alisher Usmanov blinked and sold his 30% stake in English football club Arsenal to American businessman Stan Kroenke for about £600 million, it didn’t just mark a change in ownership pattern of a footballing institution, but typified the change in the axis of football club ownership in Europe over the past decade. Not so long ago, the defining face of foreign football ownership in England was another Russian oligarch Roman Abramovich. After buying Chelsea in 2003, in one of the first foreign takeovers in English club football, Abramovich opened the purse strings to win everything. He regularly attended games at Stamford Bridge. Today, however, Chelsea has slipped a notch on the football field. And, with the shift in political relations between England and Russia, Abramovich is shuffling on the fence and Chelsea has put a stadium overhaul on hold citing the “current unfavourable investment climate". Investors from Russia and the Middle-East led the first wave of foreign ownership. For them, along with money, club ownership was also about presence, and the ensuing soft power and branding. Now, it is the turn of American and Chinese investors who are looking to ride the ongoing globalization of football, powered in large measure by the euros and pounds from broadcasting rights. And they are more bottom-line oriented. The greater the pool of money involved, the greater the presence of foreign investors on European soils. According to UEFA (the Union of European Football Associations), in the English Premier League (EPL) in 2016-17, which is a cut above every other European league in financial terms, 12 of the 20 teams had foreign owners. In English football’s second tier, 14 of 24 teams were foreign-owned. In Spain, Italy and France, the numbers for foreign ownership is relatively lower, but their presence is looming. It’s only in Germany, the Netherlands and Portugal—relatively less lucrative and more local leagues—where the idea of a wide, community ownership of a football club still persists. Germany, in fact, has a rule mandating 51% voting rights of a club to be with its members, which essentially disincentivizes investors with an overriding profit motive. In the last 15 years, American investors, each owning a sports franchise in their home country, have bought three of the biggest football clubs in England: Manchester United, Arsenal and Liverpool. Meanwhile, Chinese investors have been busy in England’s second tier and, elsewhere, in Europe. According to UEFA, since 2016, about 70% of all foreign acquisitions in the top 15 European leagues—including in both English leagues, Italy, Spain, France and the Netherlands—have involved Chinese investors. In England, for example, all four Birmingham-based clubs in the top two English divisions—Aston Villa, Wolverhampton Wanderers, West Bromwich Albion and Birmingham City—are now owned by Chinese nationals. They mean business—of a different kind. It stems from the changing dynamics of the business of football, where the nodes of growth are increasingly going from local to global. Clubs are finding that while they are reaching saturation points at home, there is appeal for what they do and stand for across the world. While original English owners focused on building and serving a local fanbase, the Americans and Chinese are looking beyond, and the big lever is TV deals. The changing revenue mix of clubs illustrates their changing commercial priorities. For example, according to Deloitte’s Money League reports, in 2008, Manchester United earned 44% of its revenues from gate receipts; by 2017, this was down to 19%. According to UEFA, broadcast revenues accounted for 46% of total club revenues in England and 51% in Italy in 2016-17. In this decade, broadcast deals in the main leagues have received a fillip from international rights every time they have come up for renewal. The share of international rights in total broadcasting rights has become the growth metric of interest for investors. According to KPMG’s The European Elite 2017, in the EPL, this was 40%, a cut above the rest—35% in Spain, 18% in Germany, 16% in Italy and 5% in France. The flood of TV money, which is some measure of viewership interest at the back end, adds to a club’s revenues, and spurred a sharp improvement in club finances. 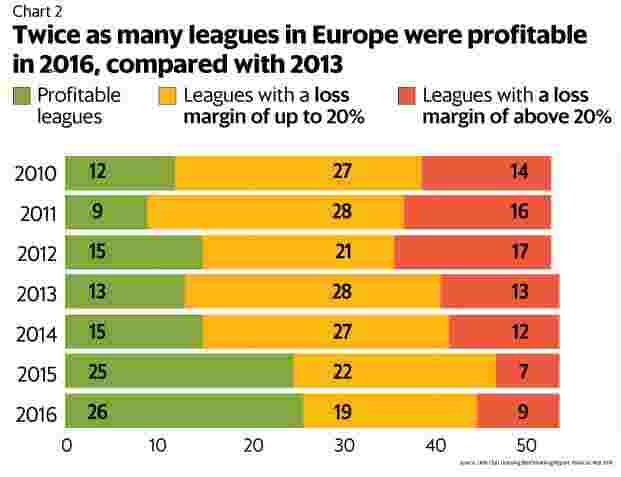 Out of 54 European leagues analysed by UEFA, 26 were profitable in 2016-17, which is twice the number in 2013-14. However, running a football club is not very profitable: costs are high and margins low. To sustain and increase fan interest, clubs have to perform at the highest level, and that often means paying big bucks to buy players. 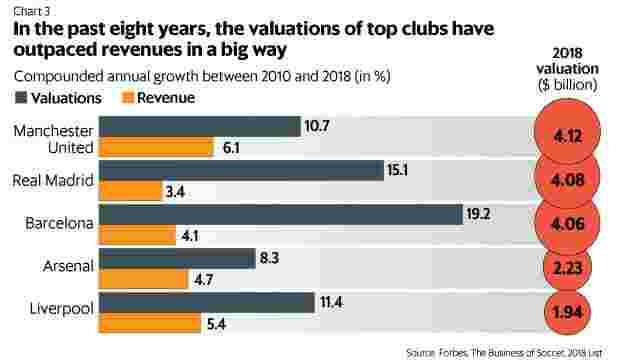 For investors, more than revenues and profits, it’s about valuations, whose growth has outpaced revenue growth for the big clubs in the past eight years. During Usmanov’s holding period of about 11 years, Arsenal’s valuation quadrupled. And now flush with a £600 million war chest, he is considering investing in another English club, Everton.